Train any time and anywhere with the PowerAlley Pro Real Baseball Pitching Machine and the PowerAlley Home Batting Cage. The PowerAlley Pro Real Baseball Pitching Machine is the most accurate and most affordable pitching machine on the market. Practice hitting and catching a variety of pitches from this pitching machine included fastballs, grounders and pop-flies. 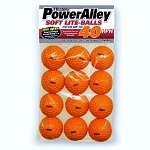 The PowerAlley also throws lite-balls up to 45 miles per hour and regulation baseballs up to 60 miles per hour so you can practice hitting and catching different balls at various speeds. Adjustable height also allows you to change the rise of the pitches. 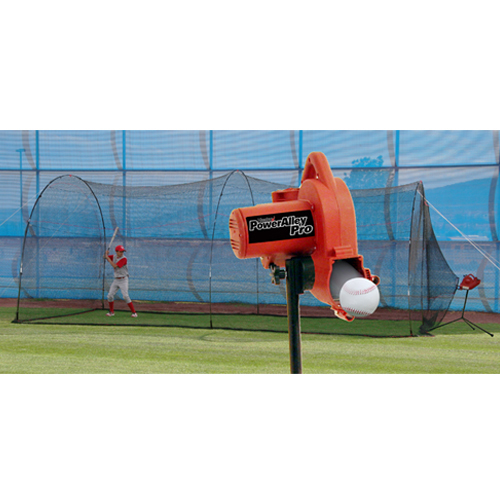 With so much versatility, the PowerAlley Pro Real Baseball Pitching machine will prepare you for anything that s thrown at you! 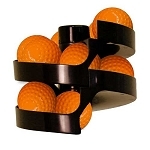 The PowerAlley Pro Real Baseball Pitching Machine is also resilient and portable. The durable nylon-fiberglass housing fully encases the motor and wheel to help protect the wheel and the people around it. The housing sits on a sturdy steel tubing tripod. Both the housing and stand are lightweight and high-impact resistant. You can also significantly increase your hitting time, and your batting average, by reducing the amount of time you spend gathering balls and practicing on your own whenever you want by adding the PowerAlley Batting Cage along with the PowerAlley Pro Real Pitching Machine. Instead of spending most of your time hunting for baseballs, you can spend more time hitting because all hit balls are contained within the net, allowing quick and easy refills. Not only do you save time during actual practice, you also don t have to spend time looking for a place to hit. You can practice right in your own backyard knowing every hit ball is within close proximity. Due to these two time-saving factors, studies show that by using the PowerAlley Batting Cage you can hit over 5 times as many pitching machine pitches than without it in the same amount of time. Due to its quality and durability, the PowerAlley Batting Cage is made to withstand the elements. 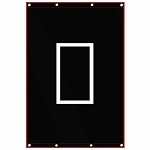 It boasts a fiberglass pole frame, which sets up with ease. Thick 1" polyethylene netting keeps any hard hit ball from escaping and sturdy ground stakes insure the structure will stay in place. This batting cage provides plenty of room for hitting, measuring 22 feet long, 12 feet wind and 10 feet high. 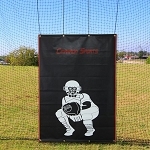 It comes with a built in harness to support the PowerAlley Pro Real Pitching Machine. Like all Heater Sports products, the PowerAlley Pro Real Pitching Machine and the PowerAlley Batting Cage is backed by a 1 year warranty and a 30 day money-back guarantee so you cannot lose! Q: Can the speeds be adjusted? 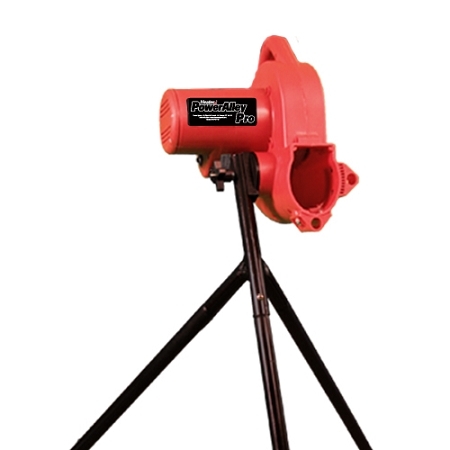 A: The PowerAlley Pro pitching machine's speed can be adjusted from 15-45 MPH with regulation size/weight baseballs and up to 60 MPH with lite balls. To ensure your satisfaction, the Heater PowerAlley Pitching Machine and PowerAlley batting cage includes a 30 Day Money Back Guarantee. Both your pitching machine and batting cage are also backed by a Full 1 Year Warranty that includes repair, replacement and labor. 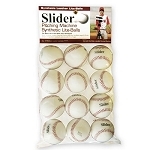 No matter where you order a Heater PowerAlley Baseball Pitching Machine & PowerAlley batting cage package from, NOBODY actually stocks them; they all ship directly from the manufacturer's warehouse located in St. George, Utah. Therefore, the shipping time frame is exactly the same no matter what website you order from (we hope that it is this one!). 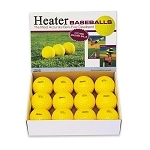 Heater PowerAlley pitching machine & PowerAlley cage combo packages typically take 2-4 business days to ship from the time you place your order. They ship via Federal Express (FedEx) Ground and could take anywhere from a day or two to a week to get to you AFTER being shipped, depending on your proximity to their warehouse. We will notify you of your tracking number the moment we receive it from the manufacturer's warehouse. Click here to download an easy to read, printable PDF of the Heater PowerAlley Pitching Machine Owner's Manual.